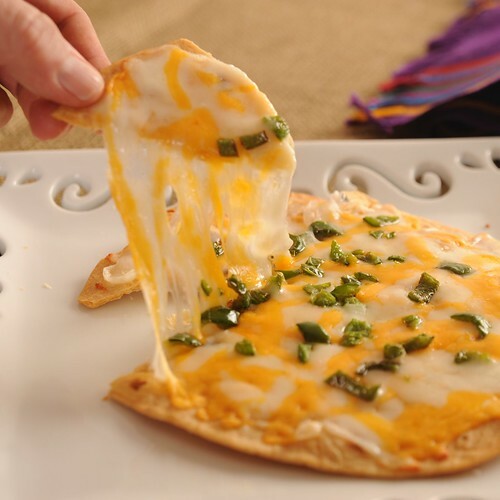 Mmmm… warm melted cheese and roasted chiles on a crispy flour tortilla. No, it’s not heaven, it’s Southwest’s authentic cheese crisps invented in our home town of Tucson, Arizona. Take Cheese Crisps for example. Tortillas. A little butter. Cheese. That’s it. Really. Sure, you can add toppings if you like. But just those three essentials are heavenly all by themselves. It is not a surprise that the Cheese Crisps there are THE best. Ever. Thin, crispy flour tortillas with a little butter toasted to perfection in the oven and then slathered with Mexican cheeses and melted again. Oh. My. Gosh.The Perfect Bite. I recently saw another food blogger from Tucson do a fabulous post on What’s Gaby Cooking? on her take on Classic Cheese Crisps. I decided it was time to post them here. After all, Sandy and I are both Tucson girls and grew up on them. Whenever I fly into Tucson, my first stop is and will always be El Charro, and my first bite will be a Cheese Crisp. 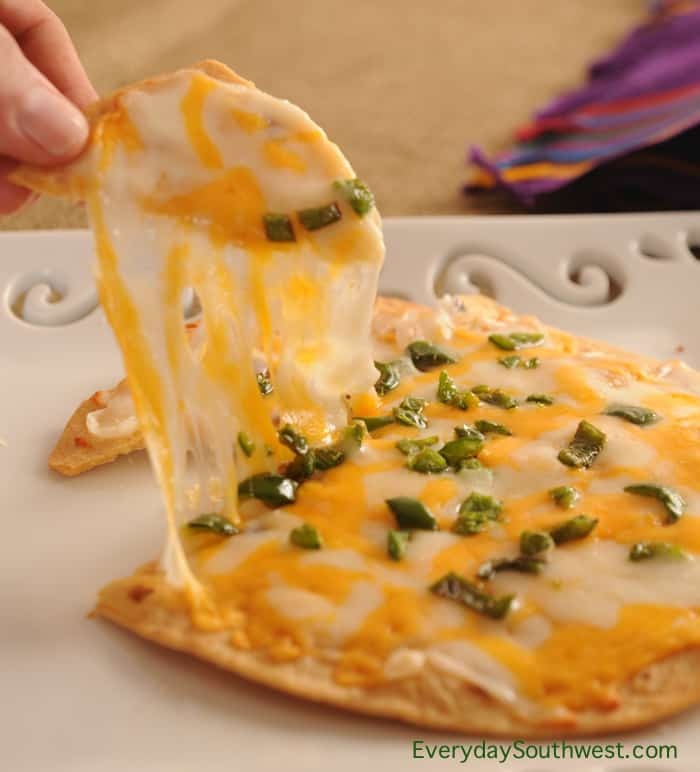 Yes, here we present to you the El Charro Classic Cheese Crisp, reinvented for the home cook. Ooey, gooey cheesy goodness at its best. Brush tortillas with a little butter on each side. Place tortillas on a wire rack on a baking sheet. Bake for 20 to 25 minutes, turning halfway through. Remove from oven and spread tortillas with cheese and chiles, if desired. Turn oven heat to 500 degrees. Return tortillas to oven for about 5 minutes, until cheese(s) bubble. Easy and cheesey – my fave combo! Thanks, Megan! Do try these! These are seriously good, but addictive. Thanks, I think, for reminding me how much I love cheese crisps. SeattleDee – A blast from the past! You are most welcome Dianne. Cheers! I agree, El Charro makes some of the best cheese crisps. Mi Nidito, on S. 4th, of course, also has killer cheese crisps. It’s amazing how many people, outside of this area, have no clue what a cheese crisp is! All locals, and visitors LOVE these. I can’t understand why they have not become more widespread! Restaurant style cheese crisps are hard to duplicate at home. Thank You so much for this recipe! Hi Paul, We love Mi Nidito! And, if you want to go really “old school Sonoran” cheese crisp, Casa Manana in Safford, Arizona still makes the good ol’ deep fried cheese crisp with green chile strips. The Casa may be the only restaurant standing that still serves them. I just broil the cheese crisps and they are delicious, but find the thinest flour tortillas! Amen, Paul! I once went to a really bad restaurant that offer Cheese Crisps on the menu. They brought me a flour tortilla that had cheese sprinkled on top and had been heated in a microwave oven. No, I am not making that up! I may have to come to Tucson soon for a REAL cheese crisp! Thanks for leaving your own personal memory of El Charro – favorite restaurant on the planet! Jami – YOU are a kindred spirit! I went to the U of A from 72-76 and used to love the cheese crisps at Casa Molina’s on Speedway. I have travelled all over and never had another like it except when I was in Scottsdale a couple of years ago and had one at Los Oliva’s. Anyone know the secret to making a great cheese crisp? The recipe is located above the comments Fred. I’ve made it, and followed it to a “t” and it is wonderful! Just like we used to get in Tucson! Growing up in Arizona, I was raised on cheese crisps… and discovered long ago that they are local to Arizona. Macayo’s in Las Vegas is the only place outside AZ I’ve found ’em, but Macayo’s started in AZ). I’m now living in Canada and hunger for the Sonoran-style comfort food I grew up on. I’ve tried to re-create them at home, with little success. 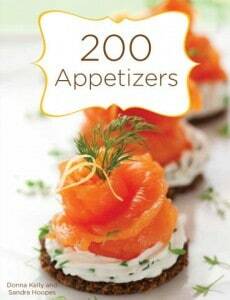 There was nothing I could do to make them taste like the restaurant ones. Your recipe using butter to crisp the tortilla must be the secret! I can’t wait to get home and try this – thank you thank you thank you! Cheese crisps and El Charro – My idea of food heaven. I can’t wait tp try this. I always go to El Charro and get the Cheese Crisp with green chilies. I don’t think there is much better in the world for a great treat. Thanks for this recipe. I used to get them in Miami at a place that is no more, Brothers II, and boy do I miss them. They upped the ante a bit by smearing them with refried beans when they come out of the oven the first time, then added chopped tomatoes, chopped black olives, scallions and a dollop of sour cream, on top of the melted cheese, when they come out the second time. Oooooeee, so good. Now, thanks to you, I can recreated my fond memories. We’re glad you love them, Bonnie! And ooooh! The refried beans and other topping are a great idea! I love mine with carne seca. LOVE cheese, and these look wonderful. I love quick and easy. Hubby likes a light quick snack. Hello Heidi, I’m amazed that our humble cheese crisps have made it all the way to Iowa! They are delicious and a favorite of mine, also. Growing up in Tucson, these are a staple appetizer at any Mexican restaurant! Moved to California only to realize nobody had ever heard of them! Found a restaurant in Santa Cruz that makes them but it’s not the same! Hi Pandora, Isn’t it amazing how delicious and simple cheese crisp is? And, how hard it is to find a “crisp” cheese crisp? I hope you like this recipe. I remember eating these when I visited Tuscon as a kid they were a favourite so when my kids asked what we ate whilst we road tripped I mentioned this searched high and low and found the recipe. It was just as I remembered and went down a hit with my cheese loving daughter – she now wants to visit to try it in the real place and not our kitchen! There is nothing better than a perfectly crisp tortilla with tons of gooey cheese. These look AH-MAZ-ING! What a delicious treat this was! It was so cheesy and delicious! I think you’re song. This IS heaven. My kid and I are addicted!! I’m all about glorious cheese! These Classic Cheese Crips were just what my husband and needed this evening when binge watching a Netflix series. How fun that it was invented in your hometown of Tucson, Arizona. We’ll be making them again soon! Now this is my kind of southwestern dish! This is so easy to make and my kids absolutely loved them. I love how easy this is. Perfect for me and my kids! Hi Sarah, Yes! Kids love these cheese crisps! You can also add other veggies that the kids love as well as leftover taco meat or diced chicken. I make them at least once a week. The only problem is that I now live in Texas and the tortillas are as fat as pancakes here. Luckily, I get back to Tucson twice a year and load up on tortillas from Anita Street Market. They freeze really well and it enables us to have our cheese crisps often. Haven’t been to El Charo in 43 years. Is it still downtown? Hi Jeannie, Aren’t Cheese Crisps the best? Yes, El Charro is still downtown. They have also opened a restaurant on Oracle RD About 1/2 mile North of Ina. I go to the North El Charro more often. There is even an El Charro to go type restaurant in the Tucson airport (just incase you fly in once and a while) I totally agree with you about the pancake like tortillas it Texas, too doughy! I haven’t been to Anita Street Market yet, thanks for the tip!